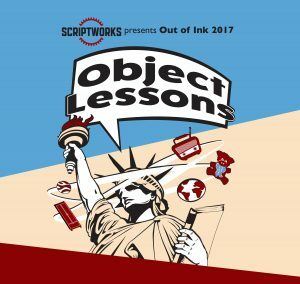 A dog’s toy, a revered text, planets, and the Statue of Liberty are just some of the objects that reveal their thoughts in ScriptWorks’ 19th annual Out of Ink ten-minute play showcase. The objects and their declarations appear courtesy of one of three contributed rules or ingredients used to write the plays. ScriptWorks members use these elements to create their ten-minute masterpieces over 48 hours during the Weekend Fling. This year’s ingredients were contributed by Steven Dietz, Professor of Playwriting and Directing at UT; Austin director and Artistic Director of Theatre en Bloc, Jenny Lavery; and Obie Award-winning performance artist/writer/director, Katie Pearl. 1) The play must somehow feature the thoughts/statements of an inanimate object. 2) The play must contain a ritual of inauguration. 3) Time continually expands or contracts for at least one of the characters. At the end of the Weekend Fling, the plays were read in a ScriptWorks Salon at the Austin Playwrights Studio. A selection committee chose eight plays for production in Out of Ink, from the two-dozen that were submitted. The committee was comprised of non-applying ScriptWorks members Vicki Cheatwood, Joanna Garner, and Michael Mitchell. Rita Anderson, Lowell Bartholomee, Trey Deason, Amparo Garcia-Crow, Raul Garza, Max Langert, Jason Rainey, and Sarah Saltwick. The plays will be performed by an ensemble of actors including Mateo Barrera, Amy Chang, Karina Dominguez, David DuBose, Gina Houston, Michael Joplin, Matrex Kilgore, Gricelda Silva, Reagan Tankersly, Katy Taylor, and Johanna Whitmore. They’ll be directed by Ellie McBride, Rudy Ramirez, Sharon Sparlin, and Lily Wolff. Designers for the project are Lowell Bartholomee, Pam Friday, Taylor Harrison, and Jen Rogers.